Serenity abounds… come and stay awhile. I am now 10000 steps shy of Shelly Beach on the Great Ocean Road! No, I’m not going mad! My wish to walk on most days of my Long Service Leave AND stay in the comfort of my own Sydney suburb, has seen me join a “virtual” trek of the Great Ocean Road! I discovered the ‘Walking with Attitude’ site last week and am slowly getting a “virtual” start on this familiar area of our beautiful country. More about my walk later. 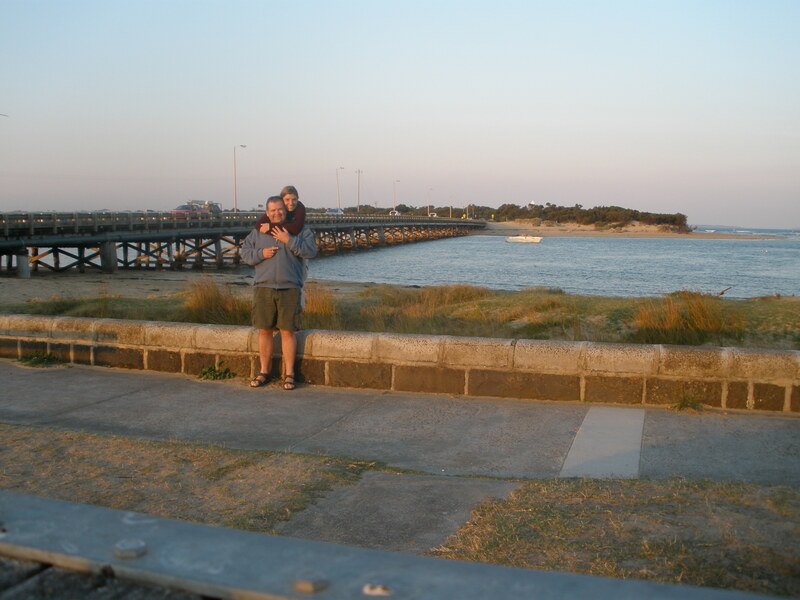 A few words about our Engagement… only 7 1/2 months after the event! The 18th of July 2009 was just under a year from the time Michael and I began dating. We went for a walk at Mt Alexandra Reserve at Mittagong in the Southern Highlands. I’ve walked there before with my mum around the time of my HSC 16 years ago, but we couldn’t find the elusive 60 ft Falls. Michael and I decided we’d find it this time. The proposal… romantic and beautiful? Yes! Perfect? No! One of the lesser-known stories about this day happened after Michael proposed and I said yes. As most couples would do, we tried to take a few photos to capture the moment for both ourselves and for our family and friends who weren’t there. This wouldn’t ordinarily be a problem for an engaged couple, but most couples aren’t on their own standing on the edge of the 60 ft Falls! Needless to say, my dexterity and nimble-footedness (in truth, my tendency to be accident-prone and clumsy) struck and as we were preparing to set the timer on the camera and race back to the place in front of the falls where we wanted to take the photo, I slipped and rolled down the slope of the rocks leading to the edge of the falls and that 60 ft drop I mentioned. Just 1 metre shy of the edge Michael’s legs didn’t budge as I rolled into them. 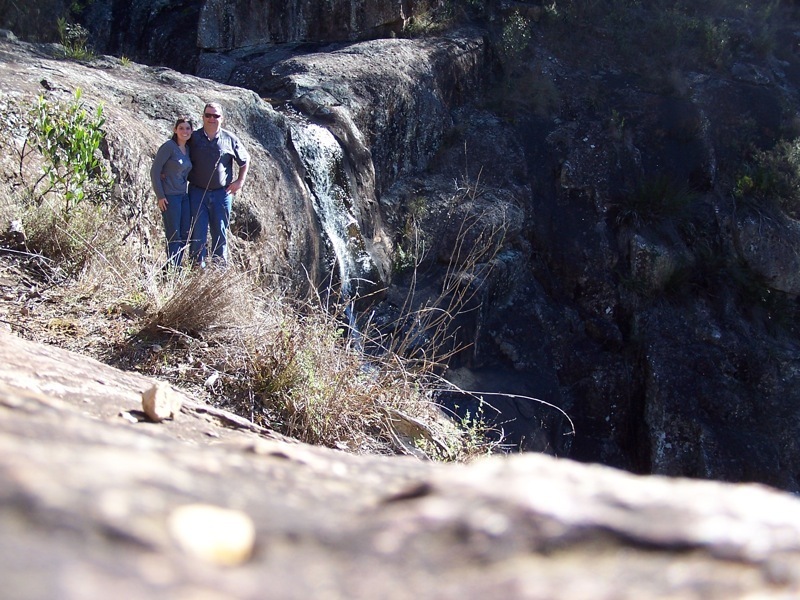 Following our busy period of Retreat and Camp, Michael and I headed on a brief, but great trip to Wentworth Falls. The start of our “surprise” trips – http://www.lastminute.com – was a raging success with a fantastic stay at a quiet and isolated spot in Wentworth Falls. The private access to Water Nymph Dell was a winner! A long and gruelling walk along National Pass for two fairly unfit walkers, the 2 hour walk around Wentworth Falls was beautiful – I’d suggest doing the walk in the opposite direction to how all the published walks suggest – a great suggestion given to us by the waitress at Conservation Hut… thank you! 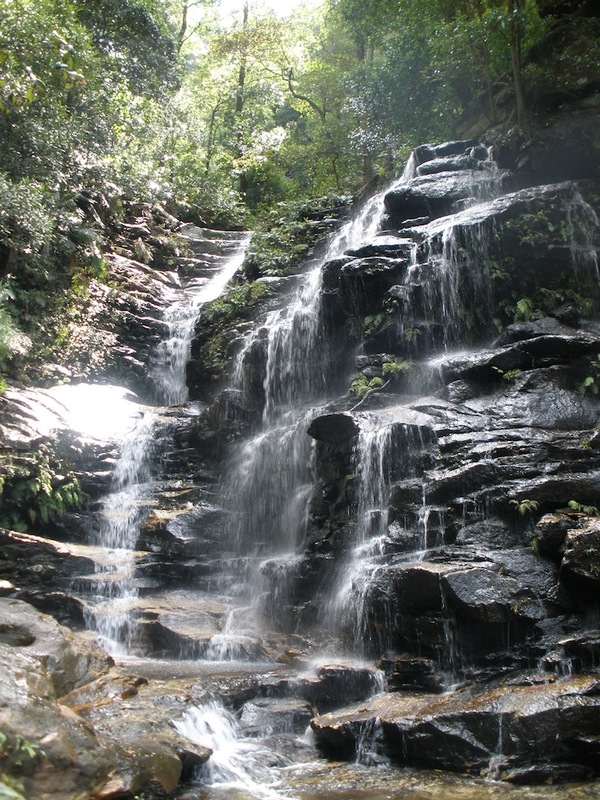 We had heaps more energy to appreciate the falls as they cascaded down the cliff below Conservation Hut, and we would both prefer the gruelling 15 min climb up the ladders on the side of the valley next to Wentworth Falls. Well, we tried! Our aim was to spend four days on a walking trip in Kosciuszko National Park, both the south and north. 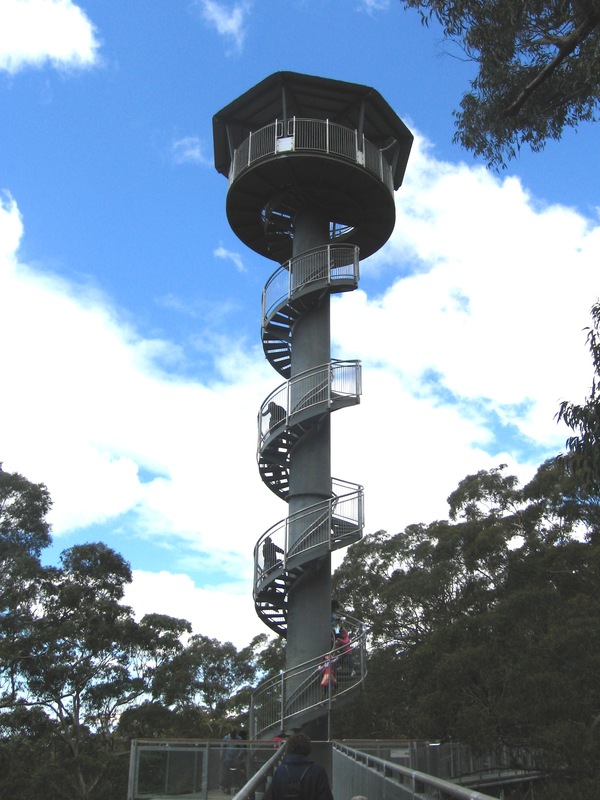 The plan was to camp for a couple of nights at Island Bend, walk the Summit Walk to the top of Mt Kosciuszko and return via te Main Range Track in one day, spend some time around Geehi and the historic huts and spend the last day around Yarrangobilly Caves and the thermal spring. Unfortunately I suffered from a bad migraine on the first night after setting up camp in a fly infested campsite and we had to head home. Thankfully, we did get a chance on the first afternoon to drive to Guthega and walk a little. We tried to find a walk suggested to us by a woman at Jindabyne Tourist Information Centre. It was quite beautiful, about the same gradient as walking up one of the chairlift runs and the walk up the first rise brought us to the base of Mt Blue Calf and still within the treeline. At Charlotte’s Pass we walked along the Boardwalk and saw Mt Kosciuszko and the walk we were to do the next day. On the way back to the campsite we spent some time at Spencer’s Creek wanting to swim in the crystal clear water. I’m looking forward to attempting this walking trip again. In the meantime… I have some fitness training to do!!! We went for a nice, brisk Wednesday afternoon bushwalk yesterday. 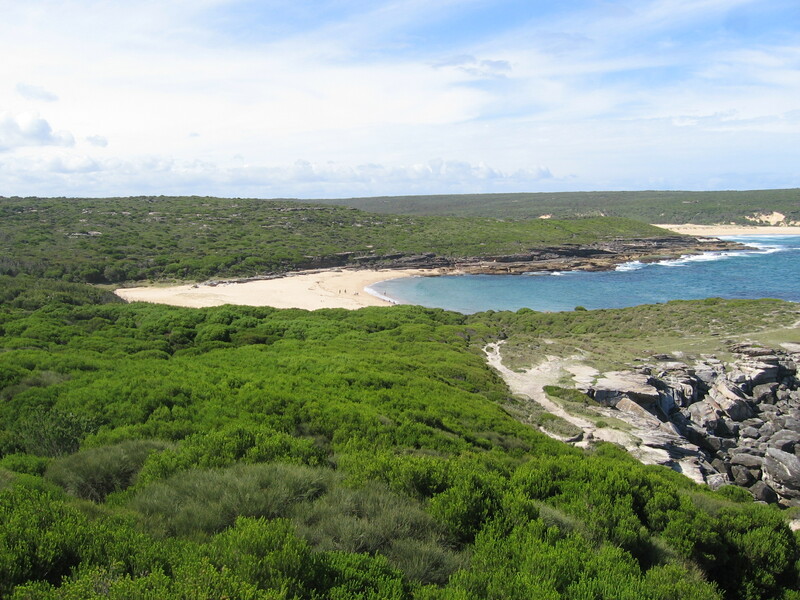 The Wednesday bushwalk is fast becoming one of the features of our holidays. At around 5.30pm we headed off just to do the Oatley Bay part of the walk, but decided part way through to extend it to Lime Kiln Bay. It was amazing how quickly a half hour walk became a 7km walk. overcast and we had a few showers at the end of our walk. It was not an overly challenging walk. I was a little disappointed by the difficulty level, but it’s also a good thing that everyone can access the views from this vantage point. Another wonderful afternoon and another wonderful bushwalk. This walk, being very familiar to myself, began at a solid pace, passed by the waterhole feeding into the inlet below and upwards to the cliffline. Unlike last time we barely stopped at the cliffs to look, instead preferring to walk on to new territory previously unvisited by Michael. My concerns were allayed about having left our walk until too late in the day as we realised there was still a bit of heat in the sun, but we had missed the worst of it by choosing to walk mid to late afternoon. On arriving at the cliffs overlooking Little Marley we were met by an exquisite view of the blue ocean meeting the blue sky on the backdrop of more cliffline beyond. Inspired by this walk we have decided that we would both like to walk the length of the coastline, but over two days and in perhaps a rather unorthodox fashion. We will see how this goes starting (we hope) next Wednesday! We covered the walk at quite a pace, but I decided that I would like to make a special effort to attempt to look at the bush I walked through and not always at my feet… not an easy thing to do but very rewarding! The cooling swim in the inlet at Wattamolla in the late afternoon was beautifully refreshing and relaxing. What a fantastic way to spend our second Wednesday of the holidays. ... I love bushwalking, watching quality films, reading books that inspire me to think about the world and why we are here. ... I hate noise, clutter and owning too much "stuff." ... I enjoy visits to places that are life giving and re-energising. ... I can't stand brussel sprouts or eating seafood that is recognisable when it's cooked (e.g. Baby Octopus). ... I am inspired by writing - journaling, blogging, writing for work or dabbling in writing for what I hope will one day be a novel. ... I am uninspired by politicians who only do good when others are watching. ... I love the sun! Bethany – Holistic Health Centre Inc.